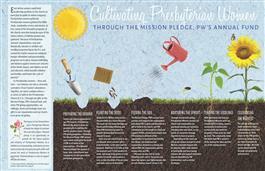 Cultivating Presbyterian Women placemats provide an informative and fun way to consider the mission and ministry of Presbyterian Women. Using the garden as a metaphor (as Presbyterian Women are caretakers of God’s abundance), Presbyterian Women “dig deep,” “plant seeds,” tend the garden, and ultimately, celebrate the harvest while being ever mindful that this cycle of care and concern is the work of each generation of faithful women. The first side of the placemat tells the PW stewardship story with whimsical illustrations. The second side provides “things to do” to tell the story of PW giving through cultivation of the Mission Pledge, PW’s annual fund, so that the PW garden can continue to flourish and provide.